Humans build, make, and eat things. If you cannot grow those critical things you must mine them from the Earth. The term mineral resources covers all solid earth materials that are mined to make modern life possible. Indiana is a powerhouse of mineral resources. Despite the state's small size and limited demographics, Indiana ranks high in production of many mining commodities. Indiana produces coal for energy. Stone, sand, and gravel are mined for building roads, bridges, buildings, and all the state's infrastructure. 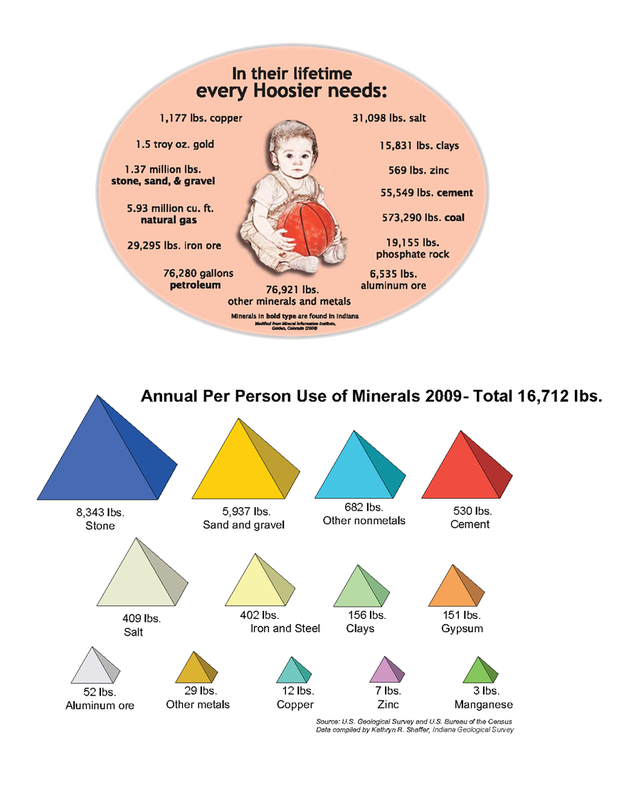 Other essential minerals needed for today's life are also mined in Indiana. A major resource is coal. Indiana produces 36 million tons of coal each year. Coal is discussed in detail elsewhere. Surface mines and underground mines provide the black gold that makes most Hoosier electricity. Modern reclamation practices restore mined areas into cropland, forests, lakes, and many attractive sites for reuse of the energy-rich acres. Indiana is probably best known for her dimension building stone. Indiana Limestone (properly named Salem Limestone) is mined in south-central Indiana but is used all over the United States. Indiana Limestone has helped construct such iconic buildings as the Empire State Building, the Pentagon, The Washington National Cathedral, and many venerable official, commercial, or religious structures. The more widespread and less uniform limestones provide for excellent crushed aggregate, cement, chemical raw material, and for limited architectural uses. Lime, produced by heating crushed stone is used in agriculture and the steel industry. A widespread but highly variable resource is sand and gravel that was formed mostly by glacial actions of large ice sheets and then sorted by running water. Sand and gravel can be used alone as fill, for gravel roads, or residential driveways. More often the coarser parts or gravels find use as components of concrete or asphalt pavement. Sand, a finer granular material, also is important in concrete and in making mortar and in snow and ice control. Very fine grained sand finds use in foundries to make molds, and also in sandblasting, glass-making, or even as golf-course sand. Very fine grained clay-rich rocks called shales are the major ingredient in brick, tile, and other fired ceramics. In the past dozens of village brickmakers used local clays or shales to make bricks using lots of hand labor. Now a handful of very large, automated, efficient plants produce hundreds of millions of bricks each year. Specialized products such as light weight aggregate and a host of art products also use Indiana shales. Shale is also an important ingredient in cement. The coarser sandstone rocks are used as dimension stone, refractories, abrasives, and for other jobs that require hard, durable materials. 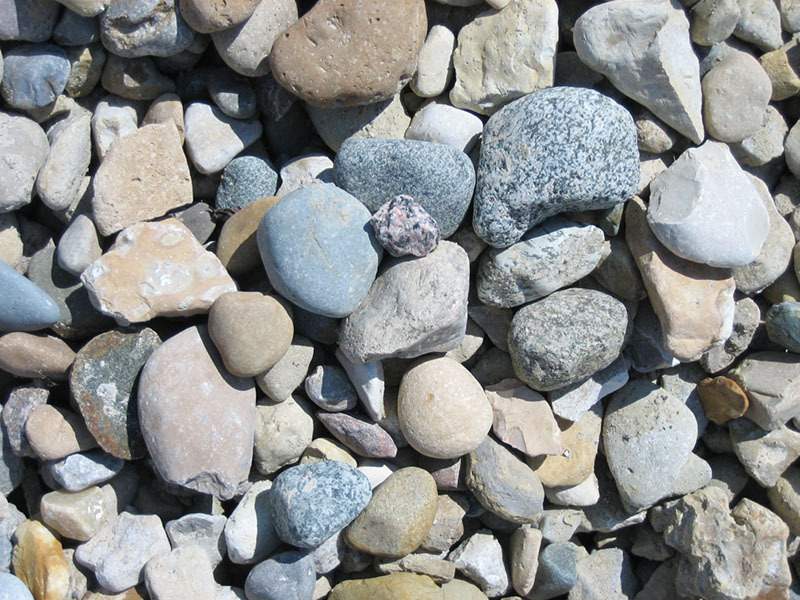 Sandstones are hard, cemented stones that differ from sands that are loose grains. Deposits of ice age peat or marl (a fine grained uncemented limestone) are mined in northern Indiana. These materials are used mostly for gardening. Man-made materials also find extensive use. Slag generated from Indiana steel mills is used as aggregate, especially in the Northwest where there is little mining of natural materials. Slag, flyash, and flue gas scrubber residues that form during coal combustion also find extensive use in construction. Indiana has abundant mineral resources that are carefully mined to provide the millions of tons of raw materials that each of us require each year.